We all need to applaud Bob Kuczewski, he carries my glider back up the dune at Dockweiler for me, each time I fly. Oh, I must not believe that because USHPA management says he's a bad dude. Last edited by Rick Masters on Tue Jan 23, 2018 1:05 pm, edited 1 time in total. Interesting notes from others: Frank, BobK, and Rick. Thanks. Will treasure such. 1. Have Bob handy to carryback wings! Oops, Bob is at work or in New Mexico or flying at Torrey or Funston! Bob's back is important also. 2. Hire a youngster! Workman's Compensation challenge! Beaches & Harbor rules? And the youngsters' spines are important also! Lawsuit? 3. Beaches & Harbor limits severely what motored vehicles are allowed on beach; lifeguards, beach maintenance, police, special $ event permits. 4. The high multiplicity of launching and landing is part of the attraction of Dockweiler flying. Scenery and people and birds are other gems of the site. Sylmar: one or two launches per day? One or two landings per day? $15 to $20 fee per carryup to launch area. 5. Prone position during the mid flight could be part of the in-flight spinal-compression relieving. I think Rick's quote is on the right track. Work and joy are both states of mind. All I know is that it gives me great joy to carry a glider so that the great founders of our sport might be able to make a few more flights than they might otherwise make. It's also given me great joy to carry back for younger pilots to preserve their strength to get more out of their training. So please don't feel that it's something special for octagenarians or USHGA founders. 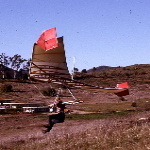 It's something I do because I love hang gliding and I love to see others love it too. == Seashore ceremony, birds, Coast Guard, friends, taught-by-Greg pilots. == Thanks to Cyndia Zumpft Klein for organizing the memorial and getting the message out. == Thanks to Joe Greblo for judicious and generous opening and closing Windsports to allow all manner of commemorative flights to occur on this special day. ============ Joe Greblo brought out a Condor 330. Bob Kuczewski had about 10 flights. Aaron flew twice. And: __?______: student: she flew once. Little to no wind. JoeF flew three times breaking his ground-distance-at-Dockweiler record because of the no-wind condition and run-launch that inspired Joe Greblo to extend a welcomed commendation; near sunset the third flight was the final of the day; thank you, Greg---fly forever. Thanks to Joe Greblo for kindly opening and closing to allow everyone to fly in remembrance of Greg. I sure wish I could have been there but desert duties came first today. Thank you Joe F for the report. One thing puzzles me: I thought ownership of Windsports changed at the first of the year. How was it that it was Joe Greblo who closed Windsports so all could fly? But however that happened, kudos to Joe G for doing that. Shelly showed with very wonderful dog Penny. Penny really likes Andy Beem. Shelly is still grounded for some knee attention. Andy opened Windsports; first flight was at 1:04 p.m. It turned out that mystery tie-down installer was Shelly! Thanks, Shelly! I did some MHG and left the Alpha 210 on the truck, as Windsports opened and thus recreational free-permit HG could not be open and free. The one wing used by Windsports used about 2% of the site's flight asset!!!!!!!!!!!!!!!!!!!!!!!!!!!!!!!!!!!!!!!!!!!!!!!!!!!!!!!!!!!!!!!!!!!!!!!!!!!!!!!!!!!!!!!!!!!!!! for the day. 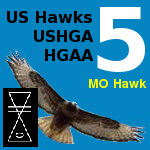 The incursion of U$hPa odd monopoly over public recreation asset is something that should be removed A.S.A.P. , I vote. And flew 6 different sorts of kites. Weather mild, fully clear sky. Wind direction changed to W only for a brief period. Exercise up-and-down sand berms to get ready for next week. Restful day. Arrived at 9 a.m. and left at 3:30 p.m. Traffic across town as surprisingly heavy. Will be planning activity on beach side to fill time until 9 p.m. before crossing town for home. At Dockweiler today (Sunday), while Windsports was open, to pick up 4 broken wheels. i'll do my standard repair on them and get to keep one pair for my Condor 225. Beautiful flying day, wind straight in, almost soarable, and Windsports was busy. I didn't take my glider because it was planned to be a quick trip for the wheel pickup. However, I had my harness and helmet with me so I did get a flight on the school's Condor 330. Also watched others flying fun and left at 3:00 pm to go by my shop and load my 330 for tomorrow (President's Day) at Dockweiler. Cyndia and Christa were there, flying. I hadn't seen them in quite some time. Met Josh for the first time. Andy was also teaching.